There's one more day of test seatings on Friday, and then a VIP reception on Saturday. It's a pretty dang big space. Definitely a completely new experience in the neighborhood! The Post's Going Out Guide is reporting that the Gordon Biersch at 1st and M is planning for an April 1 opening, which just happens to be the Nationals' 2013 Opening Day as well. The restaurant will have 226 seats inside, along with another 88 on the planned outdoor patio (they have applied for the required public space permit, but it's not approved yet). Might be a bit crowded on game days, but it will be interesting to see what kind of crowds it draws the rest of the time, especially from outside the neighborhood. The location is now on the Gordon Biersch web site, too. And the head brewer has popped up on Twitter. The sign kind of says it all, right? "Early April" -- will they manage to make Opening Day? Seems hard to believe this is actually coming. There is also a public space permit application in the window for unenclosed sidewalk seating, so you can look forward to dining al fresco at 1st and M while hordes of Nationals fans traipse past in the summer. 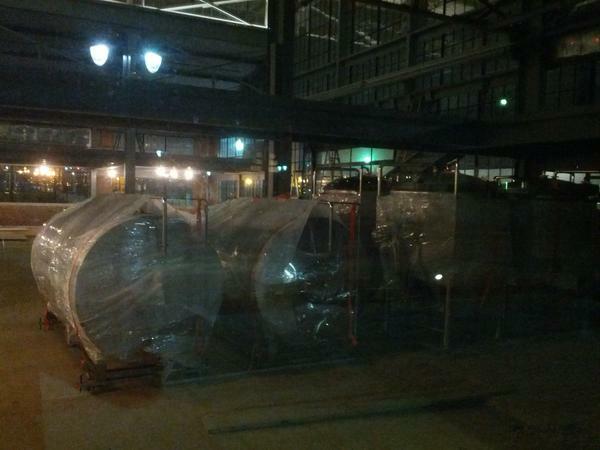 Within the past few days, readers have sent tweets with photos of brewing equipment being delivered to soon-to-be-Gordon Biersch at 100 M and inside the space at the Boilermaker Shops that will become Bluejacket. No official timeframe on when either of these restaurants will open, though a Biersch employee told the Post that he "expects the new Biersch branch to be operating in time for the Craft Brewers Conference in March and the Nats' home opener in April." As for the other beer joint on tap for the neighborhood (see what I did there? ), there doesn't appear to be any action so far in the Willie's Brew and 'Que space at the Boilermaker Shops, but with owner Xavier Cervera's long-in-the-works redo of the Hawk 'n' Dove reportedly about to debut, perhaps he'll then be able to shift resources both to Willie's and to the Park Tavern at Canal Park. UPDATE, 1/17: This Esquire interview with Bluejacket bigshot Greg Engert says that the bar will open "in May." The Washington Business Journal confirms today what I've been chasing and rumoring for just over a year now, that brewery/restaurant Gordon Biersch is indeed coming to 100 M, the office building on the northeast corner of 1st and M, SE, one block north of Nationals Park. The building permit application I saw a few weeks ago that I assumed was Biersch indicated the restaurant will have up to 236 seats indoors, and 94 outdoors.